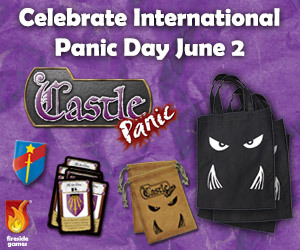 Join us for International Panic Day at Fanfare! We will be hosting an evening of Castle Panic Scenario Play for your enjoyment! Scenario play pits 2 teams head-to-head in Nightmar Mode, throwing their slain monsters into the forest of the competing team. The goal is to have the last tower standing. This is a fast playing game variant that is a tone of fun. The first 16 participants will receive special promo cards! We also have suede bags, game totes, and a “Defender of the Realm” award pin that will be given out during the event as well, some at random, some to victorious teams, and some randomly to victorious teams!